S upplemental Information Coming Soon! A guidebook for pioneering and living on the Moon. This comprehensive volume covers all aspects of settling the Moon and building a thriving and sustainable Lunar civilization. 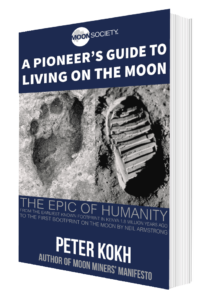 Peter Kokh is the President Emeritus of the Moon Society and the author of the Moon Miner’s Manifesto newsletter which has been published since 1986.